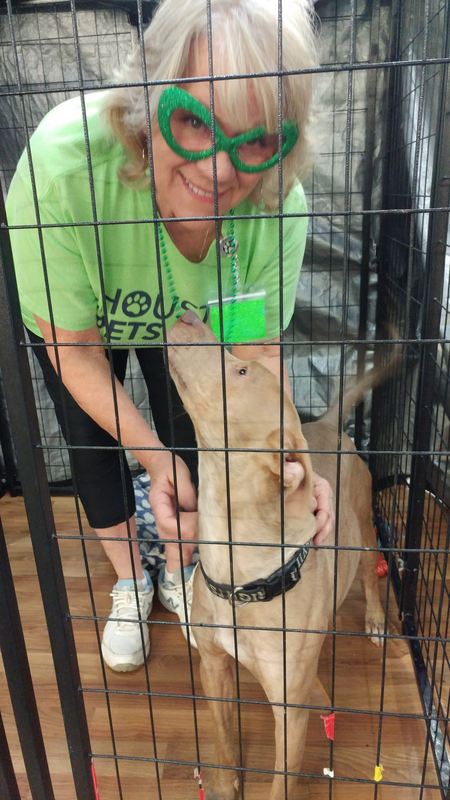 Volunteer Spotlight: Lynn Pauwels - Houston Pets Alive! Lynn Pauwels of Houston, TX has been volunteering and fostering with HPA! since September 2017. Starting out with dog care, Lynn is now a foster, volunteers at events and HPA! Thrift, assists behind the scenes answering emails and applications, and manages private HPA! Facebook groups. How did you originally hear about HPA!? Why did you initially choose to get involved with HPA! and why do you stay involved? I had been fostering rescues for another organization in Spring, TX for over 10 years and then Hurricane Harvey happened. HPA! set up in my neighborhood, took in hundreds of dogs and cats and they needed help. I stay for my love of dogs! With animal care, I cleaned crates, performed general tasks, and did some dog walking. I have fostered six HPA! dogs and adopted one, and attended adoption and fundraising events. I approve Facebook memberships and posts, answer emails for the volunteer@, info@, and thrift@ addresses, forward volunteer applications to indicated teams, and work at HPA! Thrift by ensuring supervisor coverage and coordinate staffing. What advice do you have for others looking to get involved? Find your niche and you will have a fulfilled sense of purpose. Is there a current HPA! pet that you’d like to give a shout out to? Why should someone adopt them? My foster pup, Margaret. She is sweet and loving and asks for very little in return. I was in the workforce for 44 years and retired. After I started volunteering in the fall of 2017, I was also briefly employed at HPA!’s dog facility. It was the best job I’ve ever had. To learn about becoming an HPA! volunteer, click here.